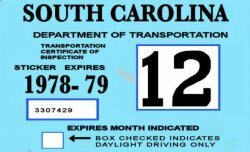 1978-79 South Carolina INSPECTION Sticker - $20.00 : Bob Hoyts Classic Inspection Stickers, Add a Final Touch to your Restoration! This 1978-79 South Carolina sticker was carefully restored both front and back keeping true in color and size to the original. It has a modern "Peel and stick" feature to allow you to adhere it to the inside of your windshield, just like the original. The sticker is actually 3 3/4 inches long by 2 1/4 inches high. A random month number will be shipped unless a specific month is ordered.